Yesterday, I spoke of the somewhat complicated nature of knowing just who Green Lantern is at any given time. Well, today, I’m adding yet another layer to that. Not only is it possible for Green Lantern to be any number of individuals, but thanks to writer Geoff Johns, it’s also possible that they may not be Green Lantern, but instead they might be a whole other color of lantern for the day. During the event Blackest Night, Nekron and Black Hand (who both have figures reviewed on this site; check them out!) created their own brand of lantern, called the Black Lantern. Essentially, they were zombies, reanimated various dead heroes. However, given the number of heroes who have died and returned through other means, they figured it would be a good idea to grab those guys too. Which is where today’s figure hails from. Also of note, there’s another new concept for this review: bootlegs. Bootlegs are unauthorized reproductions or imitations of existing characters or toys, usually done on the cheap, and meant to nab the casual buyer who doesn’t really know any better. Today, I’ll be looking at the first of a few bootleg Legos, or Bootlegos if you will. Black Lantern Hal Jordan, being a bootleg, has no official series he is tied to. Near as I can tell from the research I’ve done, he’s from a larger set of Green Lantern themed Bootlegos, produced under the name “S-World”. Mine was purchased on his own, so I can’t really speak to the others. The figure stands about 2 inches tall, and has 7 points of articulation. The quality of the plastic used is a little different, but for all intents and purposes, this guy was built on a standard Lego Minifigure body. 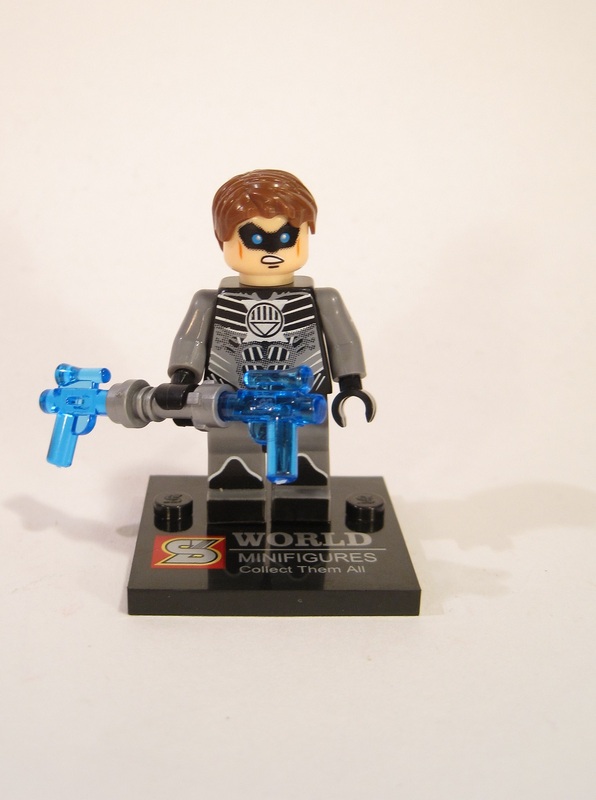 His sole add-on is a hair piece, which also appears to be an almost exact replica of one of Lego’s generic male hair pieces. The rest of the figure’s details are handled via paint. The painted work is quite surprising for a bootleg. It rivals official Lego work, and is a step above the work being put out currently by some of the bigger toy companies. The details are applied exquisitely, and capture the Black Lantern design very well. The figure includes a light sabre hilt and two clear blue blasters, which I believe are meant to be some sort of makeshift lantern, and a display stand with the S-World logo on it. Interestingly, the stand is different from Lego’s own Minifigure stand, making it the only unique piece present! To the outside observer, the identity of Green Lantern can be a bit confusing. To date, there have been six humans to bear the name, not to mention the countless aliens that use the name throughout the universe! Which one of them you think of when you hear the name largely depends on when you were introduced to DC. Many DC fans learned about the character through Challenge of the Superfriends, which featured Hal Jordan (my personal favorite). People who were fans of Justice League consider John Stewart to be the definitive GL (with good reason). And people who got pulled into comics in the 90s, well they tend to be fans of a guy called Kyle Rayner. That’s the guy I’ll be taking a look at today. 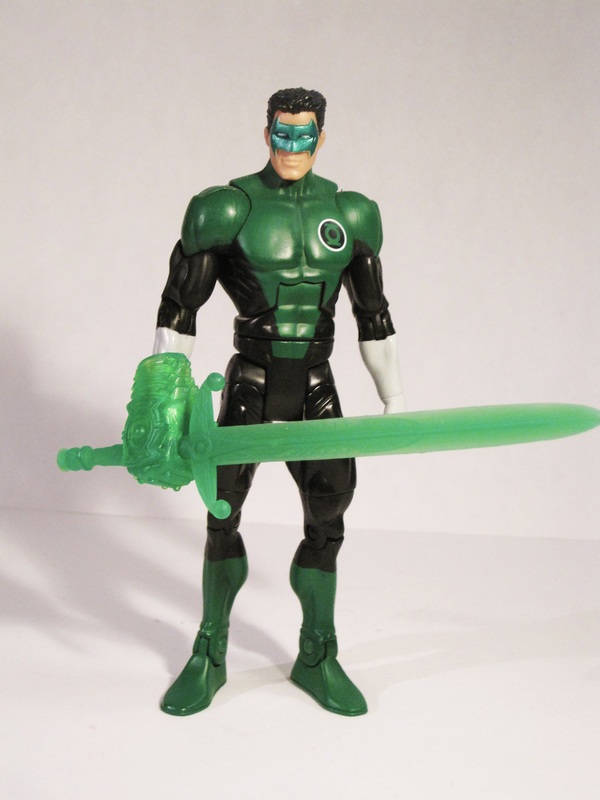 Kyle was released as part of the first series of Green Lantern Classics, which was a subset of DC Universe Classics intended to tie in with 2011’s Green Lantern. The figure stands a little over 6 inches tall and features 23 points of articulation. He’s based on Kyle’s post-Sinestro Corps War costume, which was the one he was wearing at the time of this figure’s release (I believe he’s still wearing it, though I don’t know for sure. I haven’t read a Green Lantern comicbook in almost two years.) Personally, I think it’s his best costume, so I don’t mind it’s inclusion here, but I can understand why some people were bummed we didn’t get Kyle’s main look from the 90s. Like DC Universe Classics, Green Lantern Classics was built on the buck system. Kyle makes use of the standard medium build body with a new head and a right hand borrowed from DCUC’s John Stewart. The head is a very nice piece, perhaps one of the finest head sculpts in the line. It very nicely captures Kyle’s look. The figure relies on paint to handle most of the costume’s details. The paint does pretty well, although there are a few fuzzy lines here and there, and a noticeable line of black plastic between the greens on the lower torso and the waist. All in all, it looks pretty good, though. Kyle includes a sword construct and a piece of the series’ C-N-C Arkillo. The construct is very impressive, and snaps easily over Kyle’s hand. It’s a great sculpt, and it’s nice to see include a fun accessory for a change. As a Green Lantern fan, I’m sure it’s no real surprise that I ended up with this figure. Even so, this is actually one of two figures from the first series of GLC I actually kept. This was another series where my brother and I split buying a series so that one of us could get the C-N-C. He wanted Arkillo, so I helped him finish the set. Not that it took too much pressuring to get me to buy Kyle. Even amongst all the versions of Hal Jordan offered, Kyle may well be my favorite DCUC-styled Green Lantern (although John does give him a run for his money). It’s a great figure, and I’m definitely glad I got one! 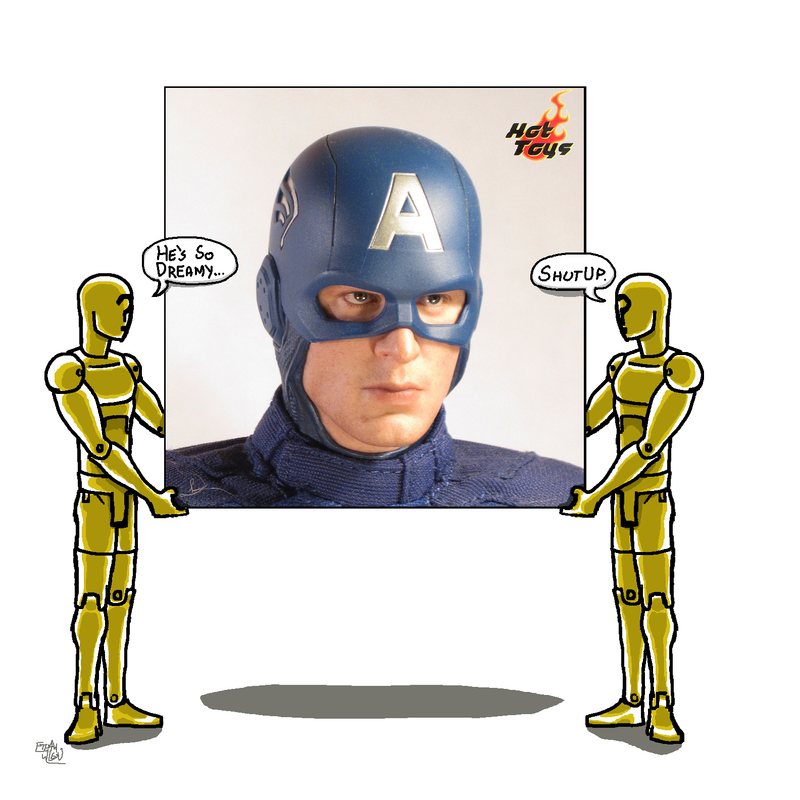 Once again, the figure is one of those produced by Hot Toys, producers of extremely high-end action figures. They like to pick up the licenses to super hero movies, so it was no surprise to see them pick up the license to The Avengers in 2012. Today I’ll be looking at a version of a character that has been HT’s bread and butter the last few years: Iron Man Mark VII! The Mark VII is a part of HT’s Movie Masterpiece Series, number 185 to be specific. He stands a little over 12 inches tall and features 68 points of articulation in his default set up. 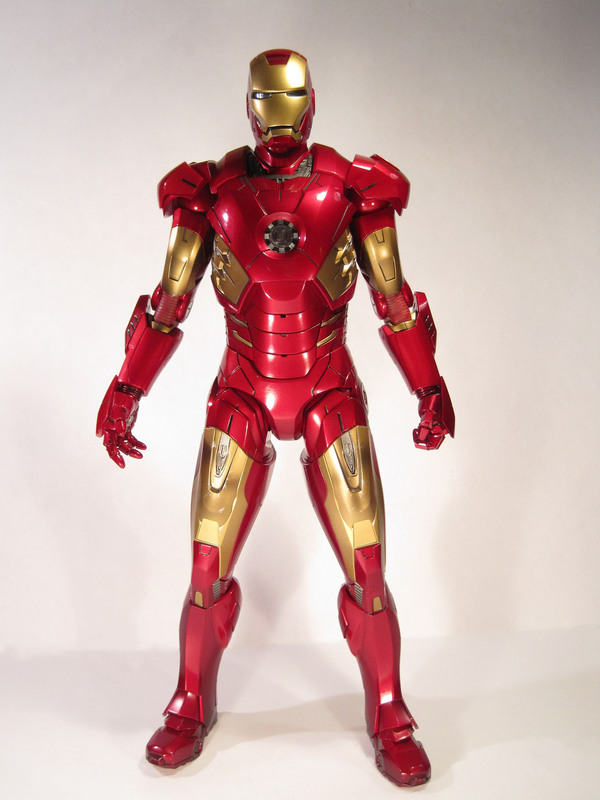 The figure is based on the Mark VII armor, which is the armor that Tony wears during the final battle in Avengers. 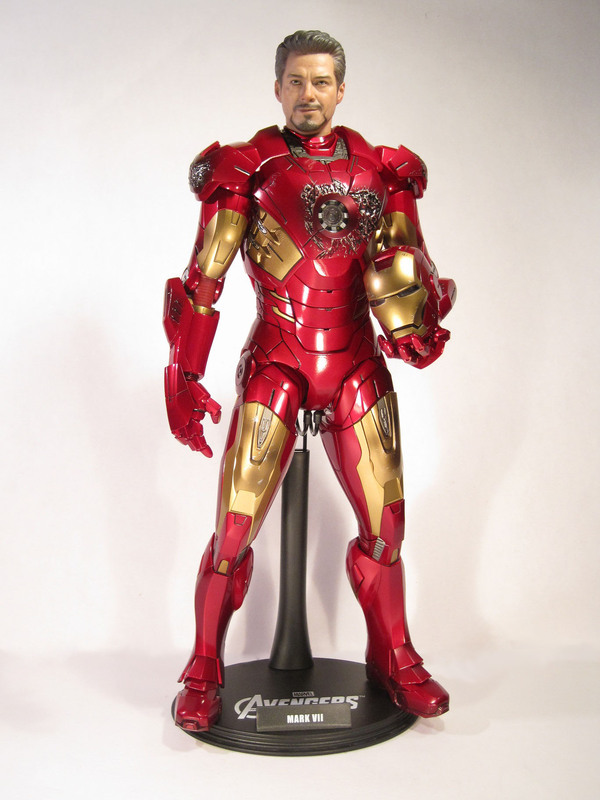 The Mark VII is different from most HT figures in that he is a fully sculpted figure, instead of relying on different materials for a costume. 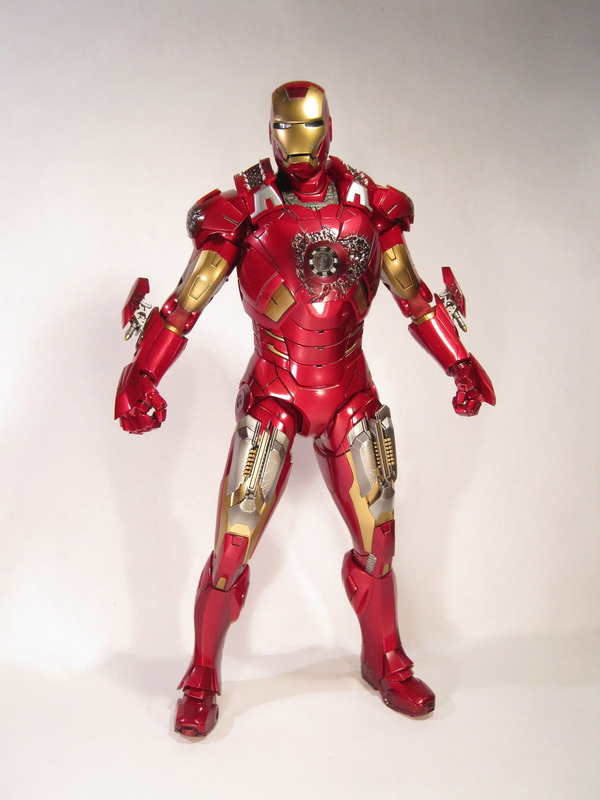 The Mark VII features an entirely new sculpt to accurately reflect the armor’s design in the movie. The sculpt is based on the 3D models of the suit created for the movie, so it should be pretty much spot on. However, there are a few areas that are noticeably off. The wrists are a tad too skinny, as are the elbows, which makes it hard to believe a person is actually inside the suit. Also, the eyes are just a tad too large to be accurate. It’s not terribly noticeable in person, but quite obvious in photos. Their only the slightest bit off, but it makes quite a difference at this scale. Those issues aside, the rest of the figure’s sculpt looks pretty much dead on. The paintwork on the figure is phenomenal, but is once again different from most HT work. On this figure, it’s absolutely imperative that the paint be exactly on the mark, otherwise the figure won’t have the appropriate machined look to him. HT has pulled this off excellently, with nothing out of place. They’ve even added a few small dings and scratches to make the armor look slightly used. Everything looks really great! The unmasked head is not unexpected, as it has become the standard for a HT Iron Man release. Robert Downey Jr must have a difficult likeness to capture, as HT has never quite had his look down. This one ends up being a bit off the mark. It’s an odd case where it’s not a bad Tony Stark sculpt, but it has only a vague resemblance to the actor who plays him in the movies. I don’t hate it, but it’s not HT’s finest work. From a technical standpoint, it’s great. There’s some wonderful texture work, and it looks like a real person, just not the one they’re going for. The paint is up to HT’s usual standard, which is certainly nice to see. The collar piece slips fairly easily over the neck and the whole thing attaches to the MVII body without too much trouble. There are six hands: two fists, two articulated, and two repulsor. All of them look great, and match the rest of the body wonderfully. I like the articulated ones in particular, as they provide the greatest variety of poses. 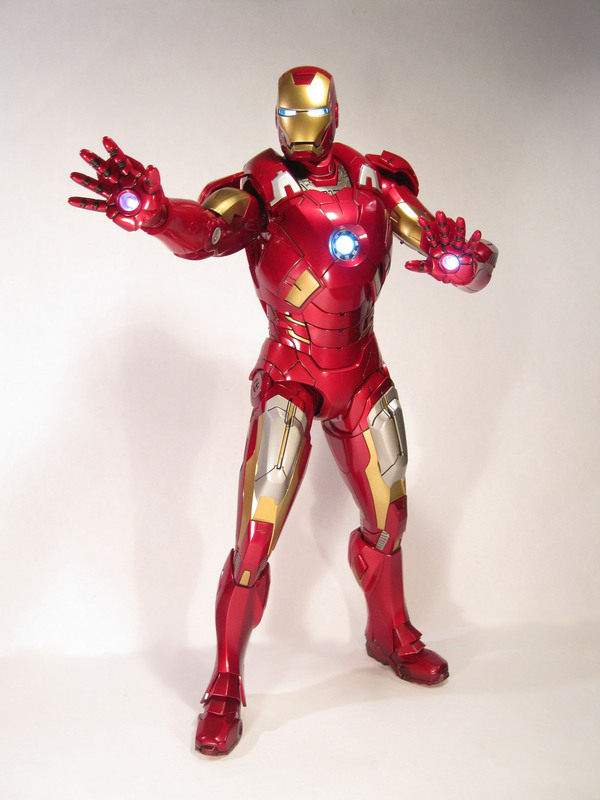 The repulsor hands have been specially sculpted to allow you to depict Iron Man with his hands in blast mode as shown in lots of promotional material, and they have their own set of wrist plates to aid in this effect. The figure also includes several pieces to allow him to be displayed in a “Battle-Damaged” mode. These pieces range from simple repaints of normal pieces to complete resculpts. They swap out with relative ease, and look pretty good when in place. The thigh and shoulder armor come in three possible sets: closed, fully deployed, and removed. The closed is what the figure comes wearing, as they depict the default look. The deployed fit well with the Battle-Damaged set-up, for that middle of the battle look, and the removed allow for the figure to be streamlined. All of the pieces swap out pretty easily, though they’ve also included a small tool to help remove the pieces without risk of damage. 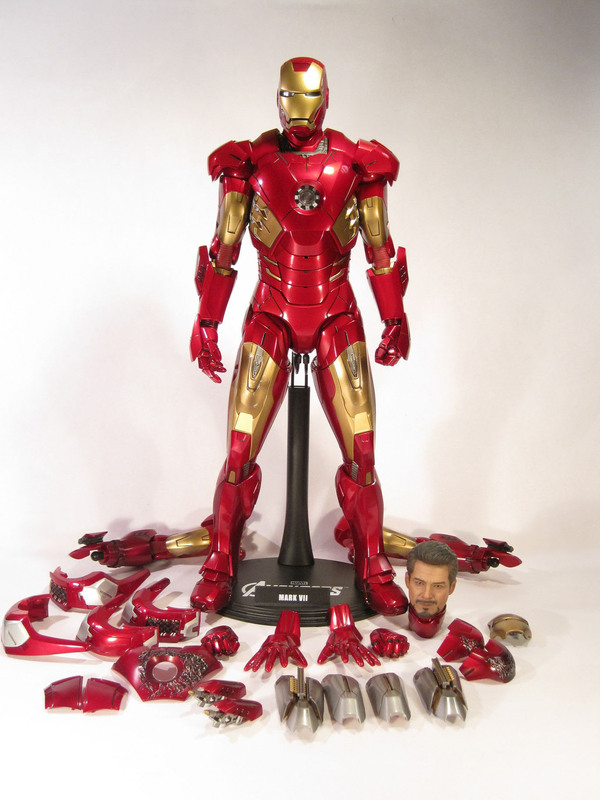 Lastly, Tony includes a basic display stand with Mark VII printed on the front and the Avengers logo on the base. It’s a simple piece, but it helps connect him with the rest of the figures from the set. I’ve been in the action figure world for about 20 years. So, it’s safe to say I’ve got a fair bit of knowledge on the terms that tend to be thrown around by collectors with little or no explanation as to what they mean. I generally try to explain a concept on its first appearance on this site, but much as Stan Lee once said to assume every comic book was somebody’s first, I too must assume that every review on this site might be the first to be read by a new visitor. As such, I’ve decided to put together a guide to some of the more frequently used terms and names that might show up. A company based in Hong Kong who are known for their high-end twelve-inch scale figures. Their figures retail at a high price, are exceptionally lifelike, and usually include a large number of accessories. They also have a tremendous after market, with more popular figures going for anywhere from two to six times their original value. One of the greatest things to come out of the 90s (aside from yours truly) is Batman: The Animated Series. The series is, in my opinion, the definitive take on Batman and his supporting cast. Since the series aired in the early 90s, it played a decent role in shaping my interests in all this comic stuff. So, it should come as no surprise that I ended up with a decent sized collection of the tie-in figures prodiuced by Kenner around the time of the show. Today, I’ll be looking at Batman’s #1 foe (other than guns and living parents) the Joker. And this isn’t just any Joker, no no. This is Mark Hammil’s Joker, the very best kind of Joker! 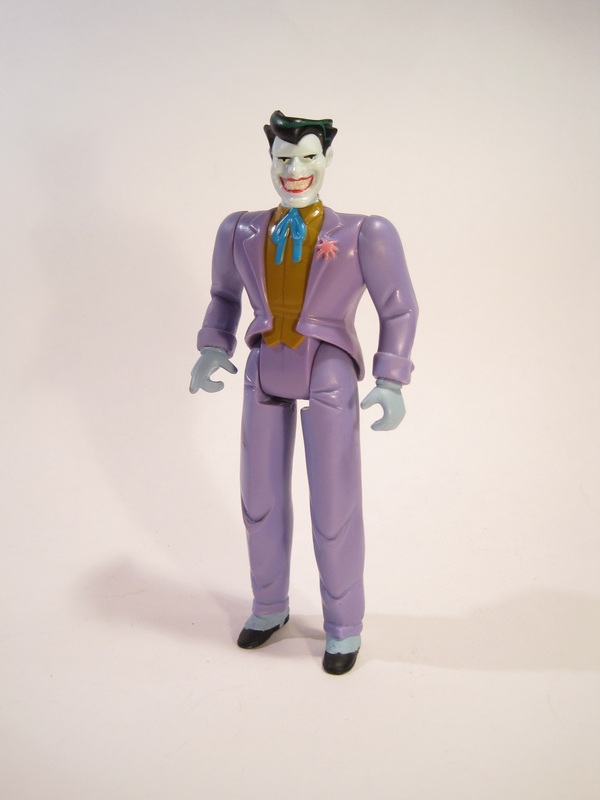 Joker was part of the first series of Batman: The Animated Series figures. He stands about 5 inches tall and features 5 points of articulation. He’s based on Joker’s basic appearance in the show, specifically his “old school” look, which is the design from the initial run of the show. The figure featured an all new sculpt, although parts of it would see re-use on later Joker figures. It’s an alright approximation of his look on the show, though it’s not quite spot on. He seems to be a bit too squat for the character, but otherwise, he looks decent. The paintwork is fairly basic, in fact he’s mostly molded in the appropriate colors, but what’s there is well applied, with little instance of slop or bleed over. The palate seems a bit off, though. The purple seems a little too pale, the yellow seems too dark, and, the biggest issue, his skin tone has an odd green tint to it. Joker was accessorized with an odd water shooting backpack with a gas mask attached. You know, like the one he had all those times on the show…. Joker was a later addition to my collection. When I was growing up, the version in the trench coat from Mask of the Phantasm was my basic Joker, as this one had long been gone from stores. A few years ago, I tracked one down at a small toy store near me. He’s a decent figure, and he compliments the rest of the Kenner line fairly nicely. It’s not an uncommon thing to see Death personified as an actual character in a work of fiction. It’s actually really common to see such a character appear in comicbooks. DC Comics actually has five separate versions of death, for various different groups of people. Today, I’ll be looking at Nekron, who is sort of the Green Lantern version of death I suppose. Sadly, he’s not the version of death that rides around on cosmic skis. Lower your standards on this one, guys. 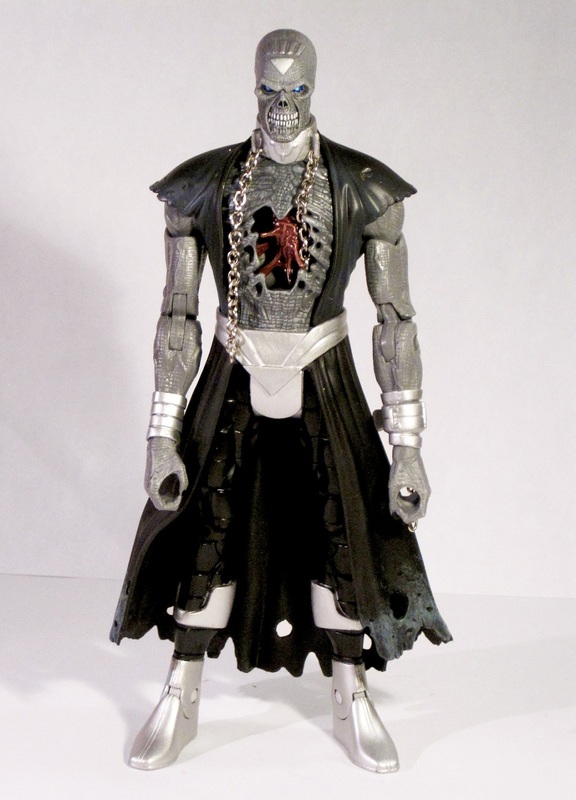 Nekron was the Collect-N-Connect figure for series 20 of DC Universe Classics, which was themed around Brightest Day, a storyline kicked off by Blackest Night, which featured Nekron as the main antagonist. The figure is about 9 inches tall and has 26 points of articulation. He’s based on Nekron’s look during Blackest Night, which is slightly different from his original appearance. 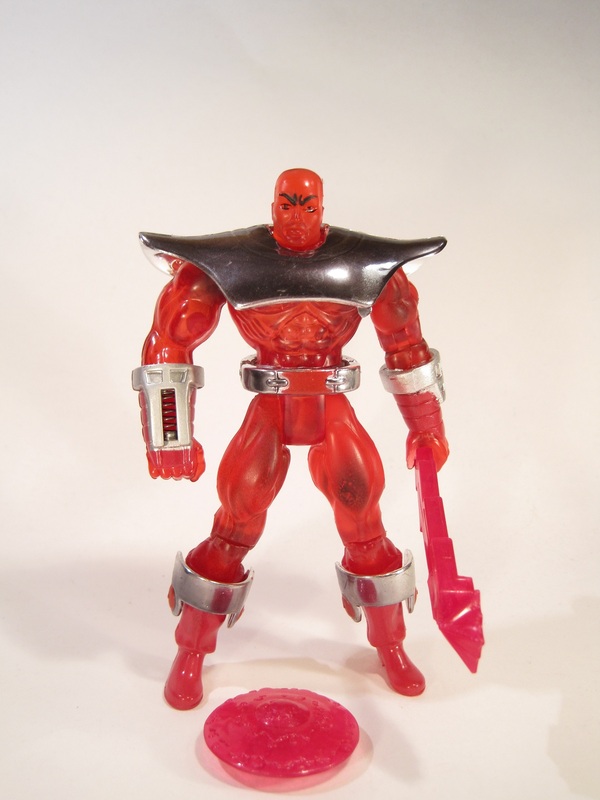 The figure features a completely unique sculpt, courtesy of the Four Horsemen. It’s pretty good, with lots of nice tattered and decaying textures. It does a decent job of conveying the corpse that Nekron is meant to be. The paintwork is actually quite nice. There’s no issues with slop or bleed-over, and he has some nice weathering to make him look like he’s been buried in the ground for a while. The figure features no accessories. Normally this isn’t an issue with a C-N-C, given that they’re packed with other figures in a series, but Nekron was initially shown with a scythe accessory that was dropped right before the series was released. It’s kind of important to the character, so the absence is kind of glaring. Time for a small history lesson. Back in the 60s, when the original GI Joe was all the rage, Japanese toymakers Takara decided they wanted to make a similar line, but in Japan. However, they didn’t have the budget to actually clothe the figures, and not wanting to make a scene by selling them naked, they instead cast them is clear plastic and filled them with assorted mechanical pieces to make them look robotic. This new line was dubbed Henshin Cyborg, and it was eventually scaled down to 3 ¾ inch scale and dubbed Microman. 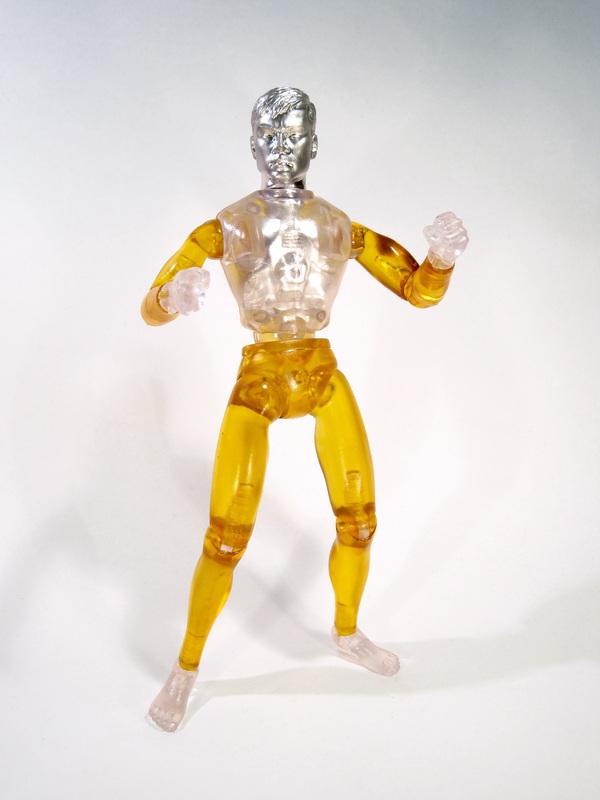 In the late 70s, Microman was brought to the US by Mego, under the name Micronauts. The line wasn’t a huge hit, but it did moderately well and it spawned quite a loyal following of fans. Fans who also tended to be fans of Mego’s more successful 8 inch lines. So, Castaway Toys, a company known for Mego-styled figures, has decided to bridge the gap with Henshin X! This figure is part of the first release of Henshin X figures. He’s one of the heroic figures, and his look is inspired by the Micronauts Time Traveler. The figure stands 8 inches tall and features 24 points of articulation. He’s built on Castaway Toys’ now standard body, which is a reworking of the Type 2 Mego body. The body has been redesigned to give it extra articulation at the elbows, knees, and ankles, as well as eliminate the need for a rubber band to hold the arms and legs in. This is a great improvement, as it means the figure is more sturdy and less likely to spontaneously fall apart. In addition to the basic body, he has a new head sculpt inspired by the old Microman/Micronauts head. He also features a piece with various gears and vents inserted into his torso for added texture. The paintwork isn’t anything too complex, mostly just pieces being painted a solid color, but that does mean everything is clean. The figure’s back, arms, and legs have been painted with a translucent yellow paint, to give the appearance of being molded in said color, and the head has been painted silver to replicate the vac-metallized heads of the figures that inspired this one. The figure includes three pairs of hands: relaxed, trigger finger, and fists. The fists are my personal favorites, but all of them look great, and I’m happy to have the option. I bought this guy at Mego Meet, a Mego themed convention that happens every year in Wheeling, West Virginia. Castaway Toys had a table set up, and this was their brand new item for this year. They had made up a small quantity of these “promo”-types to gage interest in the line, and see what people thought of them. Being a collector of cool action figures, as well as a pretty big fan of Micronauts, I was thrilled to see such a cool set of figures. I only had enough for one, but I hope that Castaway persues this as a full production line, as I’d love to get the rest of the figures that they had present at the event. This figure is a whole lot of fun, and that’s the best kind of action figure! As an animation geek and a toy geek, Resaurus’s Speed Racer line has fascinated me for quite some time. It’s a slightly out there line, and it was easy to overlook at the time, but it’s probably one of the coolest toylines to come out of the 90s. And that’s coming from a guy who got into toys in the 90s! Anyway, they covered most of the pivotal cast members from the show, plus some more minor ones. Today I’ll be looking at one of the show’s recurring heroes, Inspector Detector, who both inspects and detects. What a value! 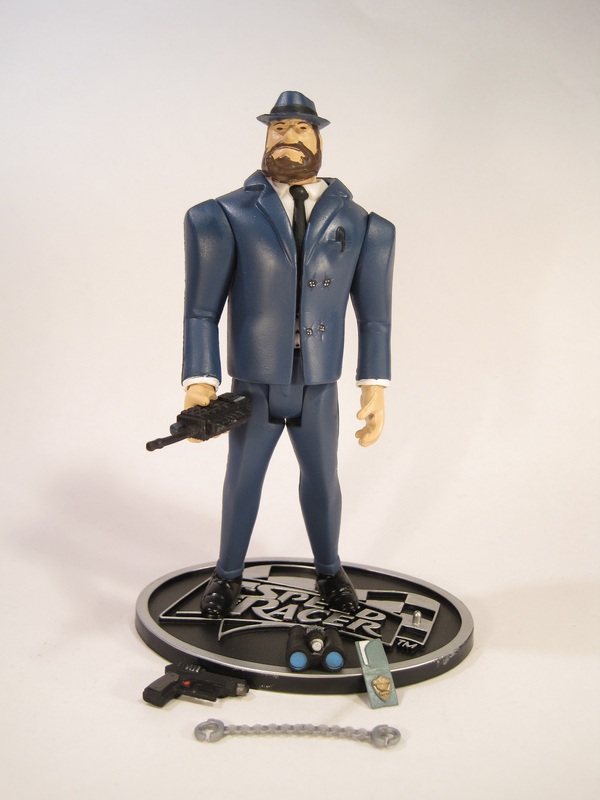 Inspector Detector was released in Series Two of Resaurus’s Speed Racer line. He stands a little over 5 inches tall and features 8 points of articulation. He’s based on the appearance of the character on the show. As far as I know, Inspector Detector only had the one look, so it was a pretty clear choice. The sculpt was brand new to this figure, and it looks to emulate the character’s design pretty well. In particular, they really managed to get the Inspector’s oddly shaped beard down in three dimensions, which is really impressive. Like the rest of Series Two, the Inspector has a more basic pose than the earlier figures in the line, which works in his favor. The paint work on Inspector Detector is pretty good overall, though there are a few slight areas of bleed over. The figure is accessorized with a walkie talkie, a pair of binoculars, a hand gun, a pair of hand cuffs, a police badge, and a display stand. 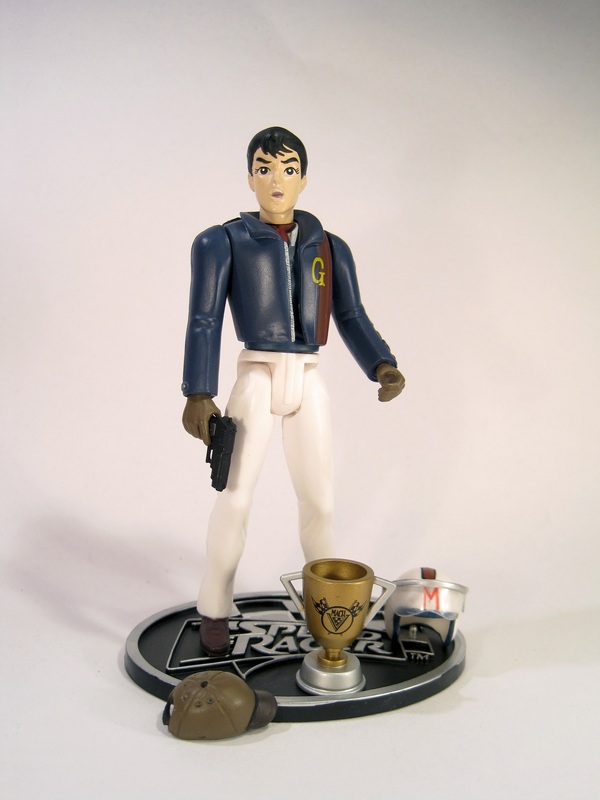 When I got Captain Terror and the Assassin at Balticon, it occurred to me that I was only two figures short of a complete set of Speed Racer figures. So, I tracked down yesterday’s Grand Prix Speed and the good old Inspector from a seller on ebay for a pretty great deal. The Inspector isn’t one of my favorite characters from the show, but he’s a unique looking figure, and he rounds out the set nicely. Go Speed Racer, Go Speed Racer, Go Speed Racer, Go! Yep, it’s time for more Speed Racer reviews. This time around, it’s the main man himself, Speed Racer! Speed was released as part of the second series of Resaurus’s Speed Racer line. The figure stands about 5 inches tall and features 8 points of articulation. The figure is NOT based on a look from the show, a trait unique to this figure. Instead, he’s a hypothetical figure, based on what the toymakers thought Speed would look like, were he to take part in the Grand Prix. The big difference between basic Speed and Grand Prix Speed is the latter’s spiffy racing jacket. It’s hard to tell, but it looks like the two versions of Speed share a torso and waist, with all the other sculpted parts being new to this figure. As a Series Two figure, he has a more subdued pose than his Series One counterpart, which actually works in the figure’s favor. The head also features a more intense expression, and generally has a better likeness to the character than the first version. The paintwork on Speed is pretty good, with no noticeable areas of slop or bleed over. I was also impressed by the Mach V logo on the back of his jacket, which looks really great. Speed includes his helmet (with a racing stripe), a hat, a hand gun, a trophy, and a display stand. After picking up Captain Terror and the Assassin at Balticon, I figured I might as well complete my Speed Racer set. Grand Prix Speed can be a pricey figure, but I was able to track one down on ebay for a good deal. Grand Prix Speed was actually the version of the character I had wanted when I was younger, but I never saw one in person. I’m happy to have finally gotten a hold of one! Professor X is typically a guy in a wheel chair, typically wearing a fairly average suit and tie. As such, he might not seem like the most toyetic character. However, he’s actually gotten quite a fair share of action figures over the years, of many different varieties. Today, I’ll be looking at one of the more out there versions. Professor X was a part of the “Mutant Armor” Series of the Toybiz X-Men line. He stands about 5 inches tall and features 8 points of articulation. The figure is based on the look Xavier would sometimes sport when having one of his “battles of the mind.” None of the pieces are original to this figure. The head comes from the previous Professor X figure. The body is an interesting story. Originally, it was meant to be released as US Agent in the third series of Toybiz’s Iron Man line, before the figure was cut from the lineup (Ironically, the figure did eventually see an unsanctioned release overseas). Then, the mold was retooled slightly to be used as Living Laser in the fifth series of Iron Man. This series ended up cancelled entirely, and the mold was once again in limbo. Finally, Toybiz got it out with this figure. Oh boy. Honestly, it’s not even the greatest sculpt. On both of the previous figures to use the body, the head was the main draw. The body’s a bit pudgy, and the torso just looks weird. On the plus side, the figure is molded in some pretty sweet translucent red plastic, which always makes a figure better. He has minimal paintwork, but what’s there is pretty solid overall. The eyebrows seem a bit bold, but maybe Professor X just pictures himself with big bushy eyebrows. The figure included a two piece snap on chest plate, a two piece belt, shin armor, a lightning bolt, and a launching disc shield. Professor X was yet another purchase from the Balticon dealer’s room. Hey, they had $3 X-Men figures, and I’m weak, what can I say? In the 90s, when these figures were still new, finding old releases was virtually impossible, so getting the more basic Professor X was a no go. So, my dad had this figure as his default Professor X for his X-Men shelf. I never had one of my own, but I was always fascinated with the figure. So, when the opportunity presented itself, I was thrilled to get this guy. I know I was a little rough on the body sculpt, but this figure really is just a lot of fun.